It only takes listening to a single track of 25-year-old modernistic musician Grimes’ songs to know she’s completely addictive! The Canadian synthesized singer has a unique indie-pop sound with a dream pop, dark wave inspired twist. From Grimes’ wonderfully unique music to her absolutely fantastic sense of style is is quite obvious this up-and-coming star will soon become fashion fodder to the world’s best photographers, designers and style mavens. Grimes has an edgy, vintage style with cool alien outfits, candy colored hair and psychedelic makeup. What sets her a part? Grimes has an amazing sense of fashion which is often showcased in her beautiful dream-like music videos. From metallic body suits featuring artful cut outs to billowy gowns with a rocker boho vibe everything this girl wears is super chic. 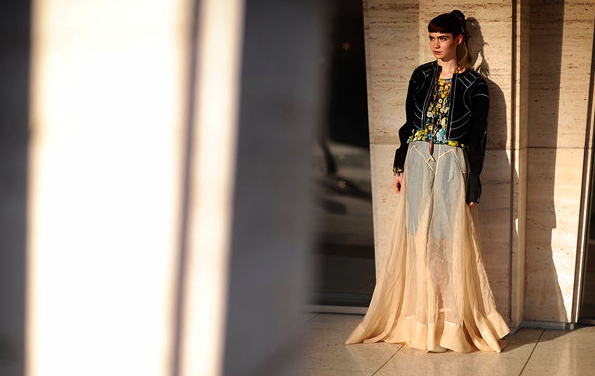 Grimes has made appearances at New York Fashion Week at her style is often coveted amongst street style photographers each trying to capture every element of her outfit. 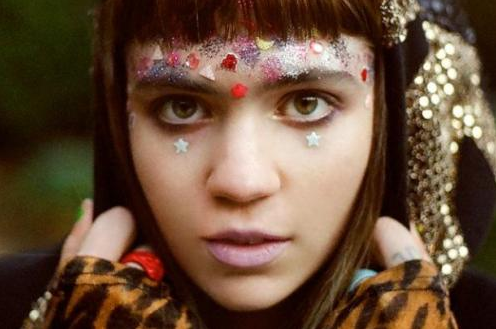 When it comes to cosmetics, Grimes is just as creative as she is with her clothing choices. From bedazzled stickers and jewels to hair reminiscent of cotton candy nothing it too crazy for Grimes! There is a subtlety and softness that floats around her face which may sound surprising considering the daring trends she has rocked. One thing Grimes is always playing with is her hair and it is common to see her wearing her locks in braids and pig tails. Youthfulness is definitely something Grimes strides to emulate through her looks. Grimes has been on the cover of Dazed & Confused and has had sub features in several other publications highlighting her outfits at big events. Grimes most recent claim to fame? Her Much Music Video Awards 2013 nomination! F&B Inc has no doubts that Grimes will continue to be an awesome icon both in the music and fashion worlds so keep your eye on this lady as she will be considered an “it girl” any minuet now!